Roth, A.S.G., Liebske, C., Maden, C., Burton, K.W., Schönbächler, M., Busemann, H. (2019) The primordial He budget of the Earth set by percolative core formation in planetesimals. Geochem. Persp. Let. 9, 26–31. The National Center for Competence in Research “PlanetS” supported by the Swiss National Science Foundation (SNSF). The primordial He budget of the Earth’s interior is commonly thought to have been set by full liquid metal-silicate equilibration in a terrestrial magma ocean. However, incomplete metal-silicate equilibration during accretion will have a substantial effect on this budget. Here we present liquid-solid partitioning experiments indicating that He behaves as a moderately siderophile element during percolative core formation in planetesimals. Mass balance considerations show that even minor disequilibrium will allow the Earth’s early core to incorporate sufficient primordial He—and possibly other noble gases—to supply the lower mantle throughout Earth’s history. We conclude that the high 3He/4He ratios in basalts may well represent primarily the last vestiges of metal-silicate disequilibrium in a terrestrial magma ocean preserved from the time of Earth’s formation. Table 1 Helium and Ne isotopic concentrations. The noble gas concentrations are in 10-10 cm3 STP/g (1 cm3 STP corresponds to 2.6868 × 1019 atoms). The 4He concentration in the olivine of the two-day experiment was not measured. The uncertainties are 2 sd and include only ion beam measurement uncertainties and sample mass uncertainties. Figure 1 Helium and Ne isotopic compositions in the run products. Materials contain mixtures of atmospheric and cosmogenic noble gases. (a) Olivine-[FeS] pairs have within analytical uncertainties the same 3He/4He ratios except for the experiment conducted at 1200 °C for 2 hours. (b) All olivine-[FeS] pairs have different Ne isotopic compositions. Error bars are 2 sd. Figure 2 Metal-silicate (liquid-solid) partition coefficients for He. The dashed line shows the average partition coefficient DHe value of 11.8 (n = 11). The shaded area defines the two standard error of the mean (2 se) of 1.8. Data for the two-hour experiment are excluded and the 4He partition coefficient for the two-day experiment is missing. Uncertainties include only gas concentration uncertainties. Error bars are 2 sd. 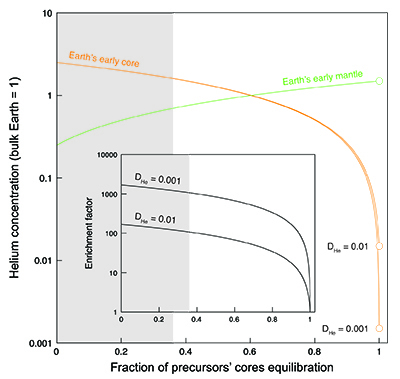 Figure 3 Helium concentration in the Earth’s early core and mantle as a function of the fraction of precursors’ cores equilibration with a terrestrial magma ocean. Mass balance calculations assume 1/3 metal and 2/3 silicate by mass and a He concentration in the bulk Earth that equals 1 (see Supplementary Information). Two scenarios are evaluated whereby metal and silicate (liquid-liquid) equilibrate in a shallow magma ocean (DHe = 0.001) and in a deep magma ocean (DHe = 0.01) (Bouhifd et al., 2013). Datasets for the Earth’s early mantle overlap on the diagram. The inset shows the enrichment factor, i.e. the He concentration in the Earth’s early core at any fraction of equilibration relative to that assuming full (liquid-liquid) equilibrium. The shaded areas represent the range of equilibration from 0 to 36 %, for which geochemical models do not have satisfactory matches between siderophile element abundances and isotopic constraints (Rudge et al., 2010). Graham, D.W. (2002) Noble gas isotope geochemistry of mid-ocean ridge and ocean island basalts: Characterization of mantle source reservoirs. Reviews in Mineralogy and Geochemistry 47, 247-317. Hilton, D.R., Grönvold, K., Macpherson, C.G., Castillo, P.R. (1999) Extreme 3He/4He ratios in northwest Iceland: constraining the common component in mantle plumes. Earth and Planetary Science Letters 173, 53-60. Stuart, F.M., Lass-Evans, S., Godfrey Fitton, J., Ellam, R.M. (2003) High 3He/4He ratios in picritic basalts from Baffin Island and the role of a mixed reservoir in mantle plumes. Nature 424, 57-59. Starkey, N.A., Stuart, F.M., Ellam, R.M., Fitton, J.G., Basu, S., Larsen, L.M. (2009) Helium isotopes in early Iceland plume picrites: Constraints on the composition of high 3He/4He mantle. Earth and Planetary Science Letters 277, 91-100. Porcelli, D., Halliday, A.N. (2001) The core as a possible source of mantle helium. Earth and Planetary Science Letters 192, 45-56. Herzberg, C., Asimow, P.D., Ionov, D.A., Vidito, C., Jackson, M.G., Geist, D. (2013) Nickel and helium evidence for melt above the core–mantle boundary. Nature 493, 393-397. Bouhifd, M.A., Jephcoat, A.P., Heber, V.S., Kelley, S.P. 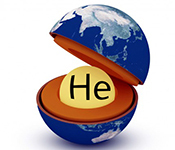 (2013) Helium in Earth’s early core. Nature Geoscience 6, 982-986. Chambers, J.E. (2004) Planetary accretion in the inner Solar System. Earth and Planetary Science Letters 223, 241-252. Yoshino, T., Walter, M.J., Katsura, T. (2003) Core formation in planetesimals triggered by permeable flow. Nature 422, 154-157. Terasaki, H., Frost, D.J., Rubie, D.C., Langenhorst, F. (2008) Percolative core formation in planetesimals. Earth and Planetary Science Letters 273, 132-137. Ghanbarzadeh, S., Hesse, M.A., Prodanović, M. (2017) Percolative core formation in planetesimals enabled by hysteresis in metal connectivity. Proceedings of the National Academy of Sciences 114, 13406-13411. Greenwood, R.C., Franchi, I.A., Jambon, A., Buchanan, P.C. (2005) Widespread magma oceans on asteroidal bodies in the early Solar System. Nature 435, 916-918. Elkins-Tanton, L.T. (2012) Magma oceans in the inner solar system. 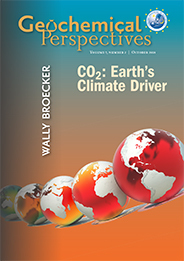 Annual Review of Earth and Planetary Sciences 40, 113-139. Porcelli, D., Woolum, D., Cassen, P. (2001) Deep Earth rare gases: initial inventories, capture from the solar nebula, and losses during Moon formation. Earth and Planetary Science Letters 193, 237-251. Schönbächler, M., Carlson, R.W., Horan, M.F., Mock, T.D., Hauri, E.H. (2010) Heterogeneous accretion and the moderately volatile element budget of Earth. Science 328, 884-887. Norris, C.A., Wood, B.J. (2017) Earth’s volatile contents established by melting and vaporization. Nature 549, 507-510. Pringle, E.A., Moynier, F. (2017) Rubidium isotopic composition of the Earth, meteorites, and the Moon: Evidence for the origin of volatile loss during planetary accretion. Earth and Planetary Science Letters 473, 62-70. Chabot, N., Haack, H. (2006) Evolution of asteroidal cores. In: Lauretta, D., McSween Jr., H. (Eds.) Meteorites and the Early Solar System II. University of Arizona Press, Tucson, 747-771. Nimmo, F. (2009) Energetics of asteroid dynamos and the role of compositional convection. Geophysical Research Letters 36, L10201. Elkins-Tanton, L.T., Weiss, B.P., Zuber, M.T. (2011) Chondrites as samples of differentiated planetesimals. Earth and Planetary Science Letters 305, 1-10. Hunt, A.C., Cook, D.L., Lichtenberg, T., Reger, P.M., Ek, M., Golabek, G.J., Schönbächler, M. (2018) Late metal–silicate separation on the IAB parent asteroid: Constraints from combined W and Pt isotopes and thermal modelling. Earth and Planetary Science Letters 482, 490-500. Dahl, T.W., Stevenson, D.J. (2010) Turbulent mixing of metal and silicate during planet accretion — And interpretation of the Hf–W chronometer. Earth and Planetary Science Letters 295, 177-186. Rudge, J.F., Kleine, T., Bourdon, B. (2010) Broad bounds on Earth’s accretion and core formation constrained by geochemical models. Nature Geoscience 3, 439-443.
) allow for partial equilibration. Consequently, the He budget of the Earth’s core may have been at least partially set in the cores of differentiated planetesimals and planetary embryos that subsequently accreted to form the Earth, rather than later in a terrestrial magma ocean. Here we present new experimental constraints on He partitioning between solid silicate and liquid Fe-rich metal at the conditions expected to prevail during core formation in planetesimals. Fei, Y., Bertka, C.M., Finger, L.W. (1997) High-pressure iron-sulfur compound, Fe3S2, and melting relations in the Fe-FeS system. Science 275, 1621-1623. Baur, H. (1999) A noble gas mass spectrometer compressor source with two orders of magnitude improvement in sensitivity. EOS, Transactions of the American Geophysical Union 46, F1118. Riebe, M.E.I., Huber, L., Metzler, K., Busemann, H., Luginbuehl, S.M., Meier, M.M.M., Maden, C., Wieler, R. (2017) Cosmogenic He and Ne in chondrules from clastic matrix and a lithic clast of Murchison: No pre-irradiation by the early sun. Geochimica et Cosmochimica Acta 213, 618-634.
. Metal-silicate (i.e. liquid-solid) partition coefficients (Di) were calculated as the ratio of the concentration of a given noble gas isotope i (in cm3 STP/g) in [FeS] and in olivine. Trull, T.W., Kurz, M.D., Jenkins, W.J. (1991) Diffusion of cosmogenic 3He in olivine and quartz: implications for surface exposure dating. Earth and Planetary Science Letters 103, 241-256. Gourbet, L., Shuster, D.L., Balco, G., Cassata, W.S., Renne, P.R., Rood, D. (2012) Neon diffusion kinetics in olivine, pyroxene and feldspar: Retentivity of cosmogenic and nucleogenic neon. Geochimica et Cosmochimica Acta 86, 21-36. ). 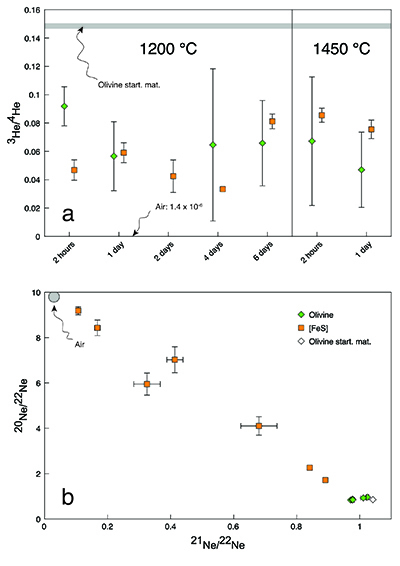 Nevertheless, our new He data imply that, despite loss of noble gases from the capsules, true equilibrium concentrations between olivine and [FeS] were measured (Fig. 2). Excluding the results from the insufficiently equilibrated experiment (performed for only 2 hours) yielded an average partition coefficient of He between liquid metal and solid silicate (DHe) of 11.8 ± 1.8 (2 se) for the conditions in our experiments. There was no resolvable difference between the partitioning of 3He and 4He (which implies no isotopic fractionation) or between the partitioning values obtained at the different run durations or temperatures. Any major non-systematic cross-contamination of the olivine-[FeS] pairs is unlikely as the derived partition coefficients for the equilibrated experiments are concordant. ). However, even at 99 % equilibration of precursor cores, the enrichment factor is still around 10.
) are only compatible with substantially higher degrees of equilibration. Heber, V.S., Brooker, R.A., Kelley, S.P., Wood, B.J. (2007) Crystal–melt partitioning of noble gases (helium, neon, argon, krypton, and xenon) for olivine and clinopyroxene. Geochimica et Cosmochimica Acta 71, 1041-1061. Matsuda, J., Sudo, M., Ozima, M., Ito, K., Ohtaka, O., Ito, E. (1993) Noble gas partitioning between metal and silicate under high pressures. Science 259, 788-790. Farley, K.A., Poreda, R.J. (1993) Mantle neon and atmospheric contamination. Earth and Planetary Science Letters 114, 325-339. Scherstén, A., Elliott, T., Hawkesworth, C., Norman, M. (2004) Tungsten isotope evidence that mantle plumes contain no contribution from the Earth’s core. Nature 427, 234-237. Mundl, A., Touboul, M., Jackson, M.G., Day, J.M.D., Kurz, M.D., Lekic, V., Helz, R.T., Walker, R.J. (2017) Tungsten-182 heterogeneity in modern ocean island basalts. Science 356, 66-69. Hirose, K., Morard, G., Sinmyo, R., Umemoto, K., Hernlund, J., Helffrich, G., Labrosse, S. (2017) Crystallization of silicon dioxide and compositional evolution of the Earth’s core. Nature 543, 99-102.
) may well represent primarily the last vestiges of metal-silicate disequilibrium in a terrestrial magma ocean during Earth’s formation. ASGR and HB conceived the idea. ASGR conducted the experiments and analyses with assistance from CL, CM and HB. ASGR, KWB and CL wrote the manuscript. All authors contributed to interpreting the results and commenting the manuscript. We thank R. Wieler for enlightening discussions. Funding: this work was carried out in the framework of the National Center for Competence in Research “PlanetS” supported by the Swiss National Science Foundation (SNSF). 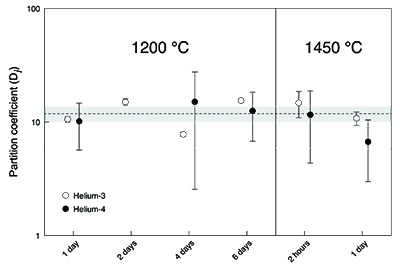 Helium and Ne isotopic concentrations were then measured using a magnetic sector field mass spectrometer equipped with a unique high-sensitivity compressor source (Baur, 1999) following the procedure given by Riebe et al. (2017). Recent experimental work (Bouhifd et al., 2013) determined He partitioning between liquid silicate and metal, at conditions anticipated in a terrestrial magma ocean. Nevertheless, based on estimated concentrations of primordial He, the Earth’s early core could still have incorporated sufficient He to supply the lower mantle to the present day (Bouhifd et al., 2013). Due to the lithophile behaviour of He under such conditions, the absolute He concentrations in the Earth’s core are low (Bouhifd et al., 2013). For example, if 90 % of precursor cores equilibrate with the mantle, our model predicts that the He concentration in Earth’s core is 18 to 168 times higher than in the case of full metal-silicate (liquid-liquid) equilibrium, depending on the assumed depth of the magma ocean (Bouhifd et al., 2013). Figure 3 [...] Two scenarios are evaluated whereby metal and silicate (liquid-liquid) equilibrate in a shallow magma ocean (DHe = 0.001) and in a deep magma ocean (DHe = 0.01) (Bouhifd et al., 2013). The new metal-silicate (liquid-solid) partition coefficient for He (Fig. 2) obtained here shows that the Earth’s core may have incorporated significantly more primordial He (= 3He-rich material) than previously considered possible (Bouhifd et al., 2013) due to a fraction of planetesimal cores that fails to equilibrate with magma ocean liquids. Many planetesimals and planetary embryos likely possessed cores that were liquid for several tens of Myr (Chabot and Haack, 2006; Nimmo, 2009; Elkins-Tanton et al., 2011; Hunt et al., 2018). The Earth is thought to have largely formed through the accretion of numerous planetesimals and planetary embryos that were already differentiated into a metallic core and silicate mantle (Chambers, 2004). 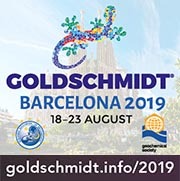 Models suggest that during descent, erosion and emulsification result in mixing and equilibration with Earth’s liquid silicate mantle (Dahl and Stevenson, 2010). These data can now be used to explore the consequences for the Earth’s primordial He budget assuming that some fraction of the precursor cores contributed to the Earth’s core without complete equilibration in a terrestrial magma ocean for the reasons outlined previously (Dahl and Stevenson, 2010; Rudge et al., 2010; Rubie et al., 2015). Due to the significantly lower melting temperature of S-bearing Fe-rich alloys than silicates, it is inevitable that core formation on these planetesimals and small planetary embryos will initially involve the percolation of liquid metal through solid silicate (Yoshino et al., 2003; Terasaki et al., 2008; Ghanbarzadeh et al., 2017) prior to the formation of a magma ocean (Greenwood et al., 2005; Elkins-Tanton, 2012) and the loss of volatile elements (Porcelli et al., 2001; Schönbächler et al., 2010; Norris and Wood, 2017; Pringle and Moynier, 2017). In this scenario, the Earth’s core could be the source of other primordial noble gases found in the lower mantle, such as solar-like Ne (Farley and Poreda, 1993). Experimental studies (Yoshino et al., 2003; Terasaki et al., 2008) and numerical simulations (Ghanbarzadeh et al., 2017) have shown that during this period liquid metal can form an interconnected network and can percolate and segregate by porous flow towards the planetary bodies’ centre. While some degree of isotopic equilibration in [FeS] can be inferred from the linear mixing trend observed between the two initial sources, the Ne isotopic composition of olivine does not substantially deviate from the starting cosmogenic composition, probably due to the much lower diffusion coefficient of Ne compared to He (Trull et al., 1991; Gourbet et al., 2012). Basalts from different geological settings (mid-ocean ridges (Graham, 2002) and a number of ocean islands and continental flood basalt provinces (Kurz et al., 1982; Hilton et al., 1999; Stuart et al., 2003; Starkey et al., 2009)) have 3He/4He ratios higher than that in air indicating the presence of an undegassed reservoir in the solid Earth rich in 3He. We conclude, based on our mass balance considerations, that the high 3He/4He ratios in basalts (Kurz et al., 1982; Hilton et al., 1999; Graham, 2002; Stuart et al., 2003; Starkey et al., 2009) may well represent primarily the last vestiges of metal-silicate disequilibrium in a terrestrial magma ocean during Earth’s formation. Interestingly, all noble gases behave similarly when partitioning between crystal and melt (Heber et al., 2007) or between metal and silicate (liquid-liquid) (Matsuda et al., 1993). The Earth’s core is an attractive location for such a reservoir (Porcelli and Halliday, 2001; Herzberg et al., 2013). Core crystallisation (Hirose et al., 2017) can be a driving force. Because there is no evidence of direct assimilation of core-derived materials into the silicate Earth (Scherstén et al., 2004; Mundl et al., 2017), diffusion must be the mechanism by which the noble gases efficiently migrate from the Earth’s outer core to the Earth’s lower mantle. Likewise, Hf-W and U-Pb isotope systems (Rudge et al., 2010) and recent N-body accretion simulations (Rubie et al., 2015) allow for partial equilibration. The lowest limit of equilibration of 36 % (Rudge et al., 2010) should be regarded with caution because more recent accretion models for Earth based on N-body simulations (Rubie et al., 2015) are only compatible with substantially higher degrees of equilibration. This “enrichment factor” rises to about 110 to 1100 when using the lowest limit of equilibration of 36 % constrained by geochemical systems (Rudge et al., 2010). Figure 3 [...] The shaded areas represent the range of equilibration from 0 to 36 %, for which geochemical models do not have satisfactory matches between siderophile element abundances and isotopic constraints (Rudge et al., 2010).